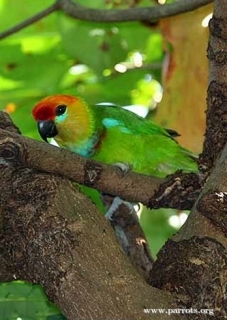 During mating, the male Desmarest's Fig Parrot places one foot on the female's back, and one on its perch, unlike other parrots. P.d. desmarestii: Both adults orange/red lores and forehead, merging to orange/yellow on crown and nape; nuchal collar blue; green hindneck; blue spot below eye; green cheeks and ear coverts, tipped with bronze/yellow; bright paler green at tips of elongated feathers; upper breast has pale blue stripe, bordered below by orange/red stripe; yellow/orange inner wing coverts edged with yellow/orange; underwing stripes wide and off-white/yellow. Bill grey/black. Eye dark brown. P.d. intermedia: Both adults as in desmarestii, but much deeper orange crown and nape; green cheeks and ear coverts with orange/yellow tips to a few feathers; blue nuchal collar missing or minimal. P.d. occidentalis: Both adults deep golden/yellow cheeks and throat, turning to bright yellow on elongated ear coverts; paler blue below eye and more green; blue collar absent. P.d. blythii: Both adults as in occidentalis, but with brighter orange/yellow cheeks; blue below eye absent. P.d. godmani: Male-blue on occiput and below eye absent; orange/red crown and nape with yellow stripe on hindneck; bright yellow cheeks and ear coverts; pale blue band across breast more extensive, but orange/red band below absent or minimal. Female-green hindneck, yellow band absent. P.d. cervicalis: Both adults as in godmani, but with blue nape and hindneck; breast band darker blue; orange/buff tinge to lower breast and abdomen. P.d. desmarestii: As in adults, but with dull yellow crown. P.d. intermedia: As in adults. P.d. occidentalis: As in adults. P.d. blythii: As in adults but with blue below eye. P.d. godmani As in adult female. P.d. cervicalis: Green crown and nape. Calls are described as high-pitched and thin, with down slurring contact call. Also chattering and clinking notes, and oft-repeated chet-chet notes at the nest. Walk-in aviary, minimum length 2.1m (7 ft), or indoor enclosure minimum length 1.8m (6 ft). Dried figs soaked in filtered water a few hours, two or more per bird daily; drop of vitamin K additive; fruits such as: apple, pear, orange, banana, cactus fruits, pomegranate, forming at least 50 percent of diet; soaked sultanas; berries such as: elder, mountain ash, pyracantha; spray millet; small seed mix such as: canary, oats, safflower and a little hemp; cooked pulses; rearing food made from: hardboiled egg, wholegrain bread and carrot, all ground to crumbly consistency; for breeding: mealworms and maggots (only if well cleaned); complete kibble. Are vigorous chewers so provide plenty of bird-safe, unsprayed fir, pine, willow and flowering branches, wooden and vegetable tanned leather toys, perches and heat sterilized pine cones. Also provide overhead misters for bathing, or shallow bowls of water. L-shaped box, floor area 5" x 10" and 5" high (12.7cm x 25.4cm x 12.7cm). Western subspecies is probably in decline because of deforestation and the wild bird trade. P.d. desmarestii: Northern and eastern regions of Vogelkop Peninsula, Irian Jaya. P.d. intermedia: Onin Peninsula, Irian Jaya. P.d. occidentalis: Salawati and Batanta, W Papuan Islands and western and southern Vogelkop Peninsula, Irian Jaya. P.d. blythii: Misool, W Papuan Islands, Irian Jaya. P.d. godmani: S New Guinea from Mimika River, Irian Jaya, east to Fly River, W Papua New Guinea. P.d. cervicalis: SE New Guinea, west to Fly and Noord Rivers. Found up to 1300m (4264 ft), locally to 1650m (5412 ft) in lowland and hill forest, riverine forest, forest edge and sometimes savanna. Diet consists mainly of figs and their seeds, nectar, and probably insects. Gathers in small groups to feed high up in the canopy on fruiting figs. Will nest communally in groups of up to three pairs. Very active, they dart from branch to branch and fly rapidly through the trees, searching for food.